Of all the memorable words and images to emerge from the four-day state visit to England by Irish officials , the most memorable might be yet to come. Queen Elizabeth confirmed that a member of the royal family will plan to attend the centennial commemoration of the Easter Rising in April 1916. Such an invitation has been discussed publicly for some time. Many in the mainstream Irish political parties feared the 1916 Rising commemorations might be hijacked by Sinn Féin, but republicans may now begin to fear the British royal family could steal the show. The presence of a member of a royal family should help ensure nobody steals the show and that the commemorations marking the first World War and the events that led to Irish independence will be truly inclusive of all strands of political opinion on the island of Ireland. The decision is drawing criticism from historians such as Diarmaid Ferriter, a member of the advisory group working on the centenary. 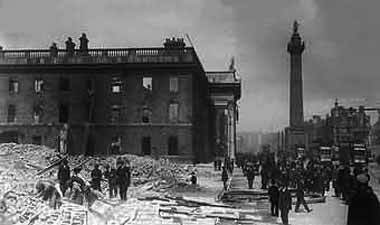 The GPO after the Rising. This entry was posted in History, Politics and tagged 1916 Rising on April 14, 2014 by admin. Growing up in a mid-twentieth century Irish American household, with a father who was a great storyteller and proud of his Irish heritage, I was told the Irish could never forgive the British for the centuries of oppression, and I should never forget the atrocities perpetrated on the Irish by the British. Fast forward to today’s news that Ireland is welcoming with open arms the British royalty, the very symbols of that oppression, to help celebrate a rising against that same royalty and their country! Is Ireland so needy of British approval they are bending their knees to the oppressor, having abandoned all sense? Forgiveness is only valid if the transgressor is truly remorseful and offers relevant restitution to the victims. I have seen none of that from the British to the Irish, and cannot offer forgiveness to those who so wronged my ancestors. I agree Mark, it really is pathetic behavior by the West Britons in Ireland. We owe it to the memory of all those abused and tortured souls of 1916 and all victims of british rule in Ireland to never forget and never forgive until the british government and royalty admit to all the centuries of genocide and beg us forgiveness for all their sins against our people, but our forgiveness aside, God will have the final judgement on the evil empire, may those responsible burn in Hell.